These sculptures are solid masses of timber. Their mirroring and proximity create a tension between them. 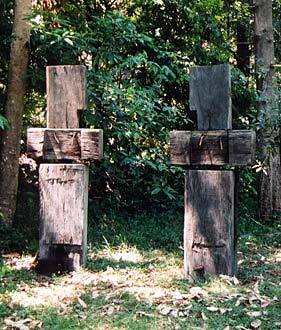 I think that the strength of the character in these sculptures stems, in a great part, from the assemblage of raw, found materials with minimal modification. Because they are found materials that are no longer available, this is a one-off sculpture. Price: (AUD)$7,200 + GST for the pair.